Native Instruments have introduced the latest product in their Traktor range, the Traktor Kontrol S4. Combining an extended version of the existing Traktor Pro software with a dedicated hardware controller, the Traktor Kontrol S4 is aiming to provide an all-in-one solution for digital DJs. The controller comprises a four-channel mixer, an integrated 24-bit/96kHz audio interface based on NI's Audio 4 DJ, and interface sections for looping, cueing, track browsing and effects control. Two sample decks are among the new additions. Up to eight beat-synched or one-shot samples can be added simultaneously to mix, with the option to capture and loop recordings from the live mix, according to NI. Meanwhile the jog wheels, based on "a new patent-pending electromagnetic technology", are run over NI's high resolution NHL protocol and are said to offer a superior performance than that of standard MIDI. For those who don't like the idea of ditching their time-coded vinyl or CDs, they will be pleased to learn that this feature is scheduled in as future update, presumably during early 2011. The video below takes a closer look at the new sample decks and loop recorders. 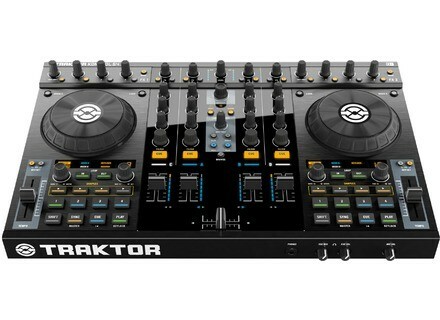 Traktor Kontrol S4 will be available this Winter with suggested retail price of $999/899 Euro. Mixware Magma Switchbox .V2 The new Magma Switchbox .V2 is designed to make it easier to transition between two digital DJs, without having to unplug the decks and mixer to connect a new soundcard.